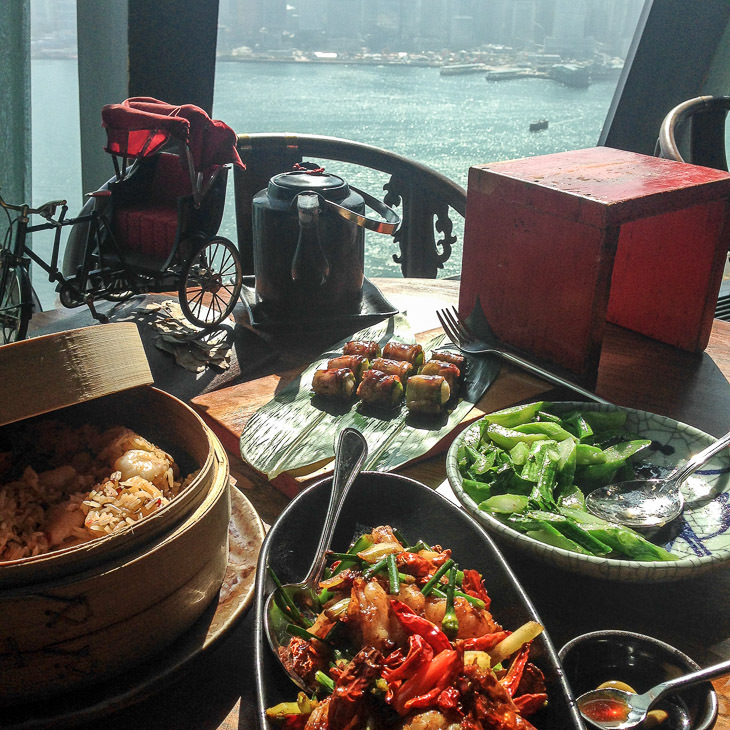 One of the highlights of our return visit to amazing and mesmerizing Hong Kong was without a doubt the food. 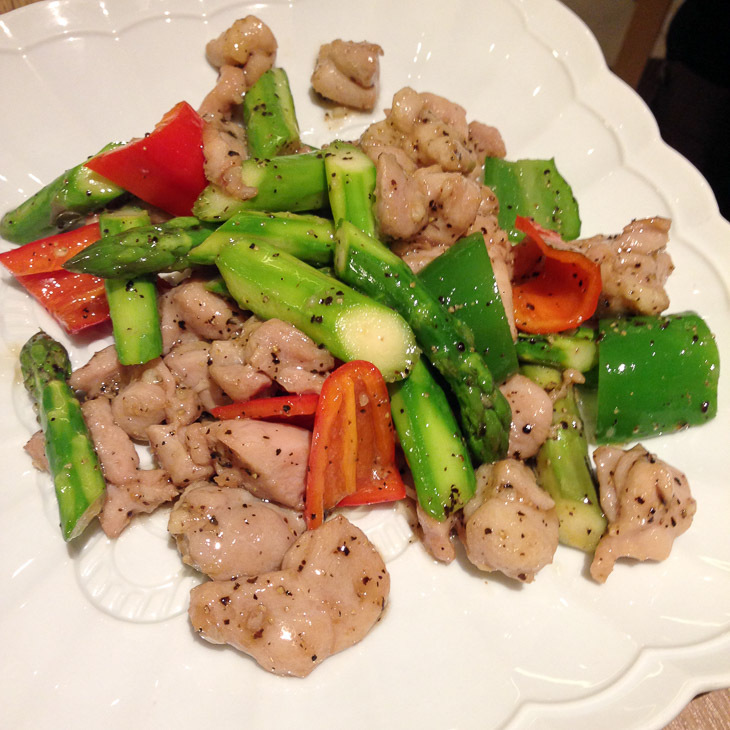 Ever since our one month adventure in China in the summer of 2013 we have been big, very big, fans of the local cuisine. 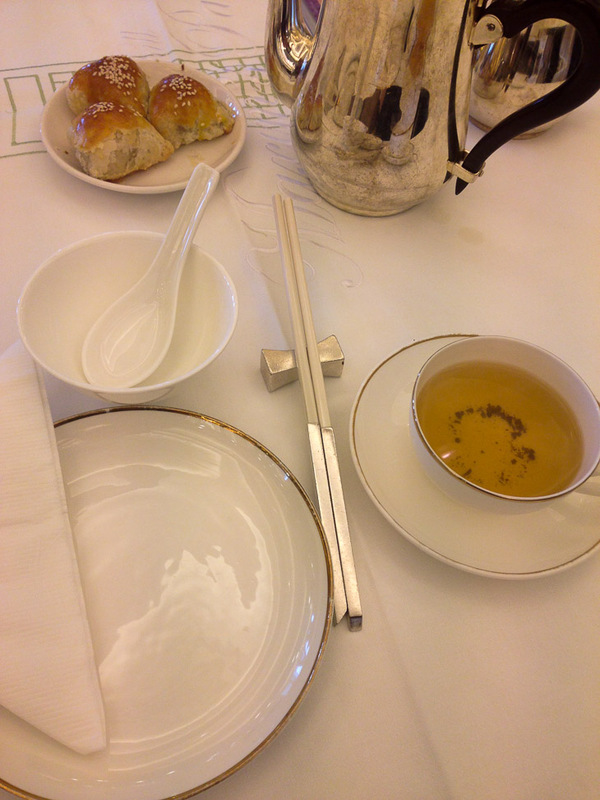 Especially dim sum. 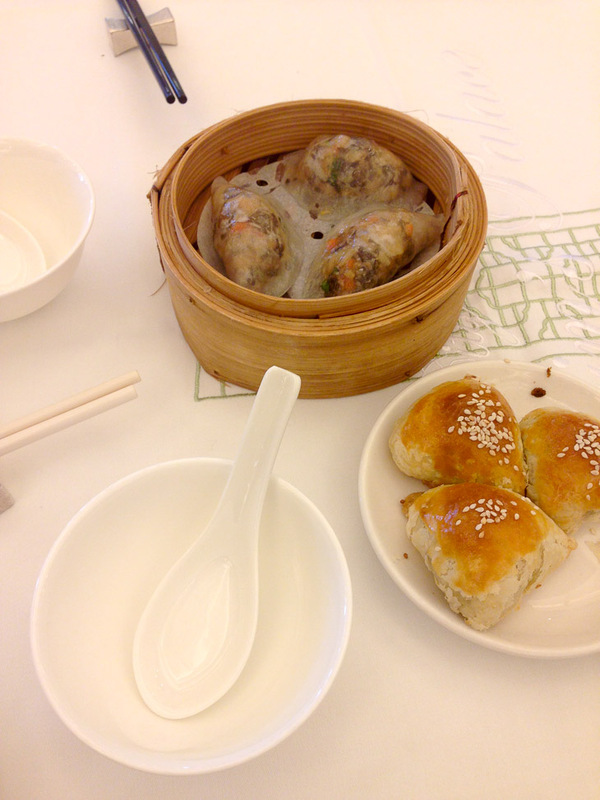 You seriously can wake me up anytime for hot and steamy shrimp dumplings or xiao long bao. Seriously. Anytime. 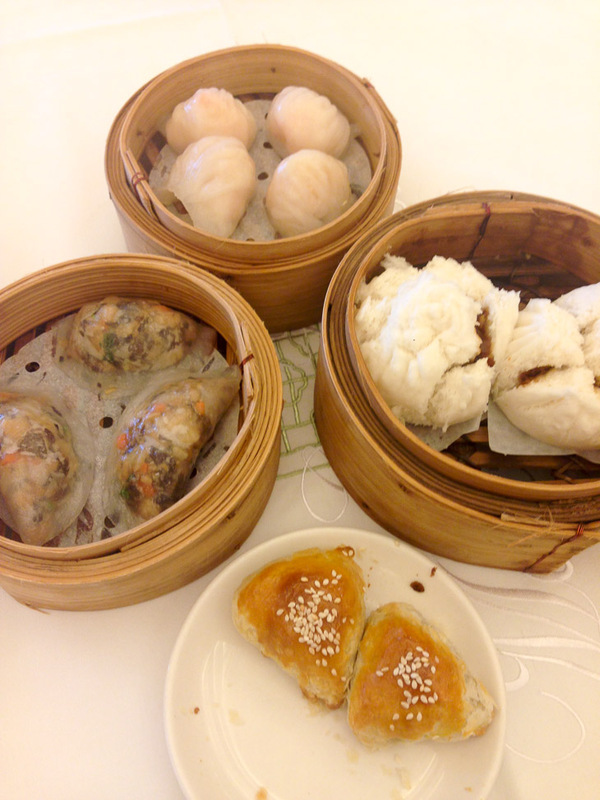 Fun fact: dim sum literally means “to touch your heart”. I love that. 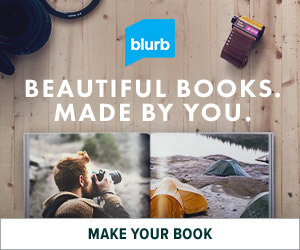 And you know what, it actually does! 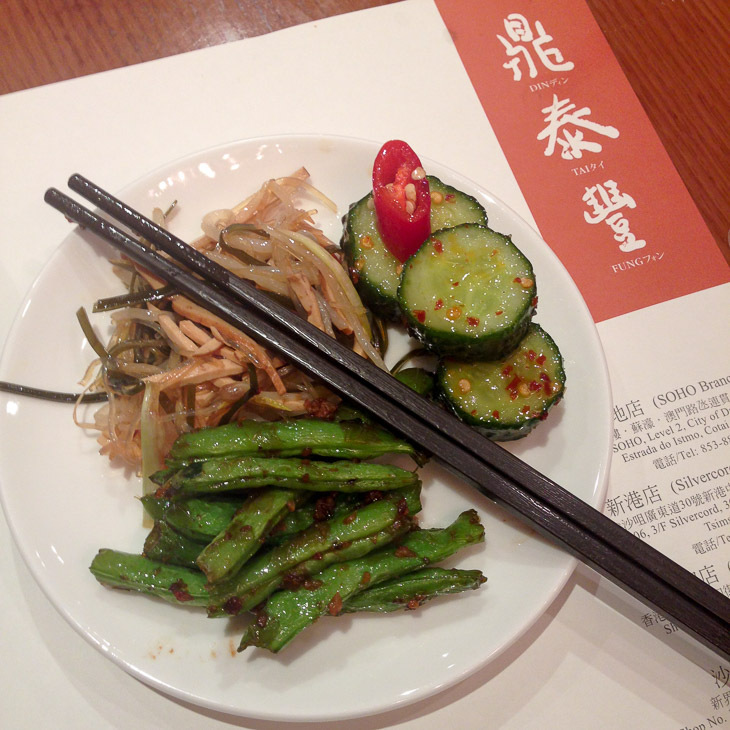 Here’s a roundup of my favourite food finds in Hong Kong. Take notes people! 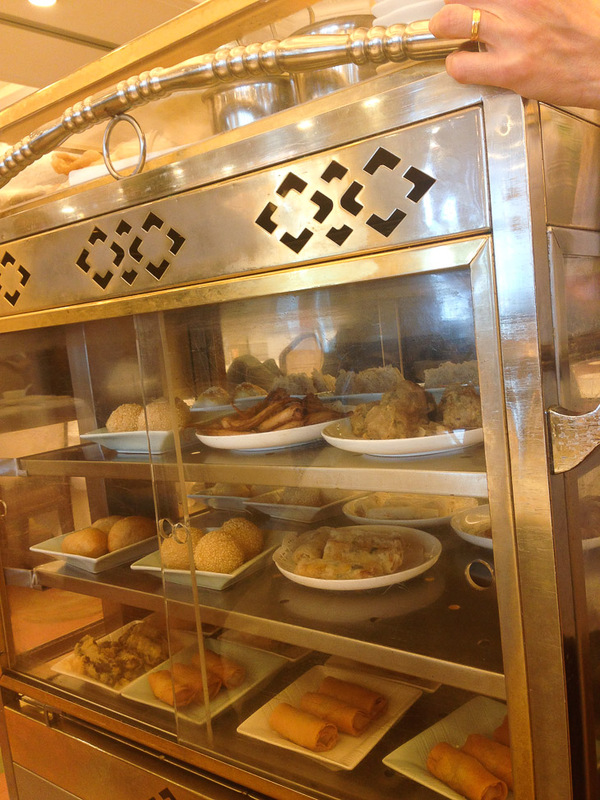 The main reason you want to go to Maxim’s for dim sum is for the authentic experience. Lovely ladies push around these old school trolleys that are packed with bamboo steamers filled with hot and steamy dumplings. How awesome is that? Do like us, and come for a late lunch since you will likely be seated right away instead of having to wait in line. When you enter the big dining room at the City Hall branch (you should definitely pick this one) you will be escorted to a table by one of the ladies. 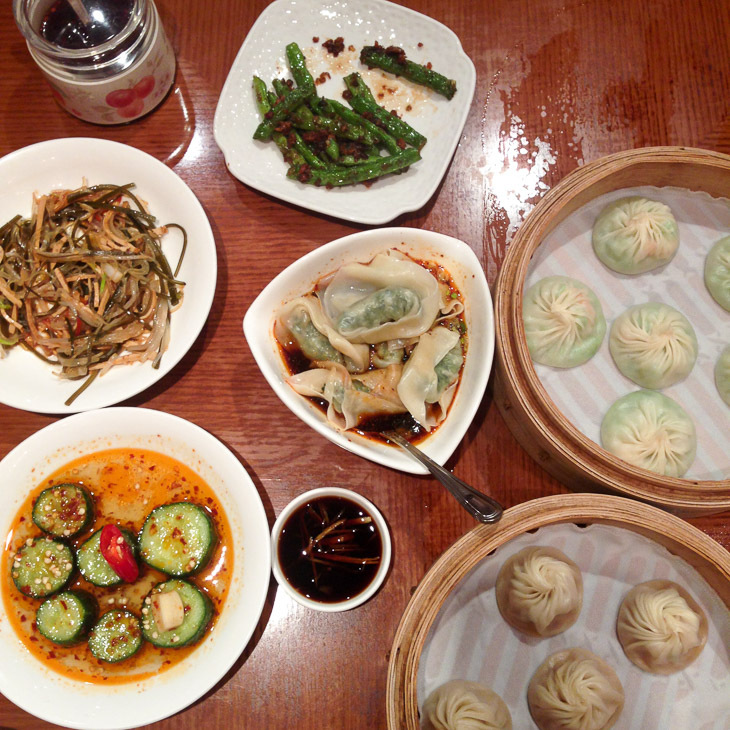 Order some Jasmine tea to help flush all the delicious dumplings down. Then just point to something on the trolley. I know this will be tricky for a lot of people, but for me half the fun is just to wing it and hope that you picked freaking delicious items. And we did, yay! Don’t forget to order the sesame covered sweet balls, I’m telling you: YUM. Every time you order something the ladies will stamp your card, and when you are finished you just take your card to the check out counter and pay. 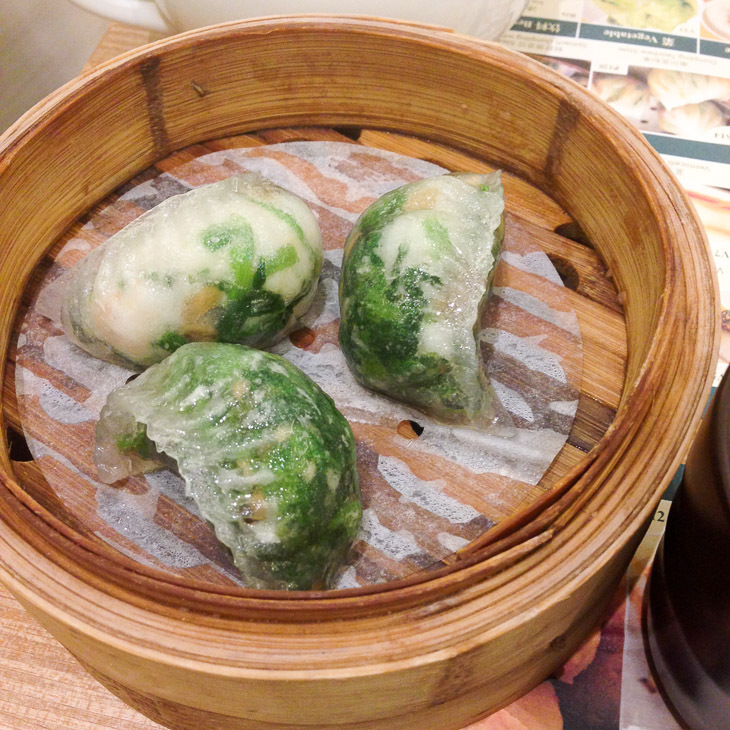 Ultimate authentic dim sum experience in Hong Kong: check. 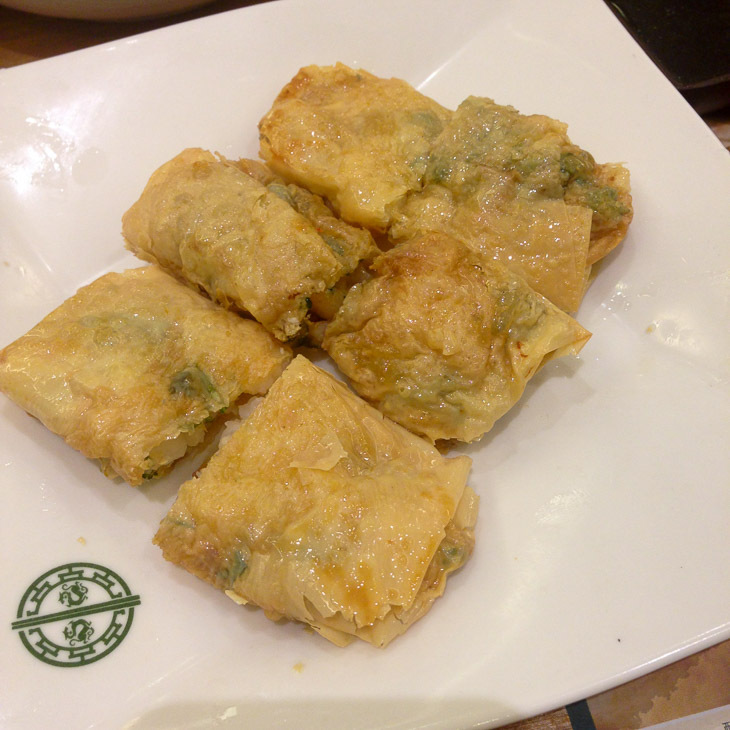 Known throughout the world as the cheapest Michelin star restaurant in the world, Tim Ho Wan always has big crowds, in and outside the restaurant. 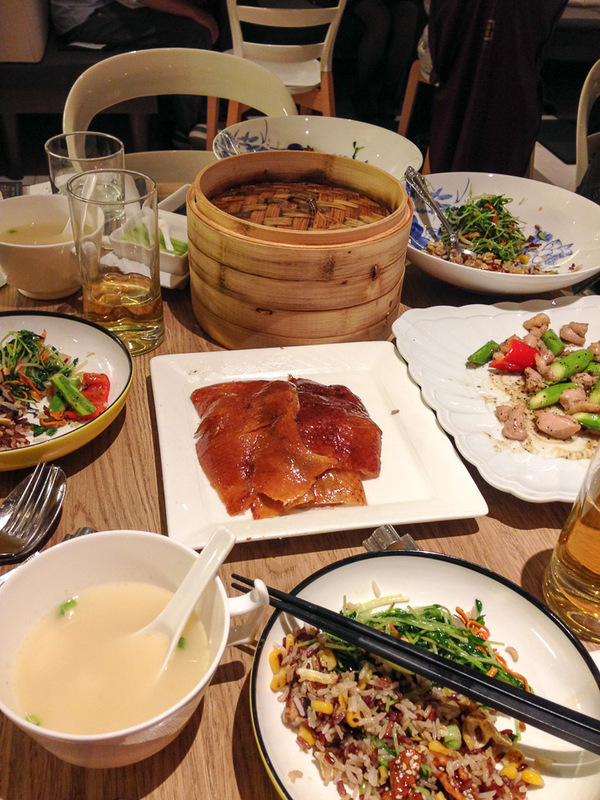 The first branch was openend in 2009 by the former head dim sum chef of the Four Season’s since he wanted to offer high quality dim sum for affordable prices. Can we take a moment to thank this man, please? 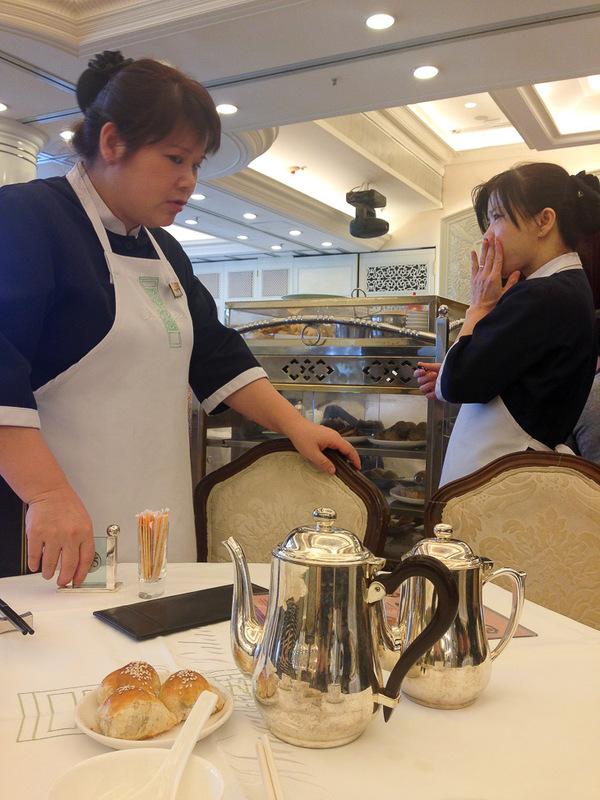 Only a year later he received his first Michelin star and Tim Ho Wan is now serving amazing yum cha in five locations. 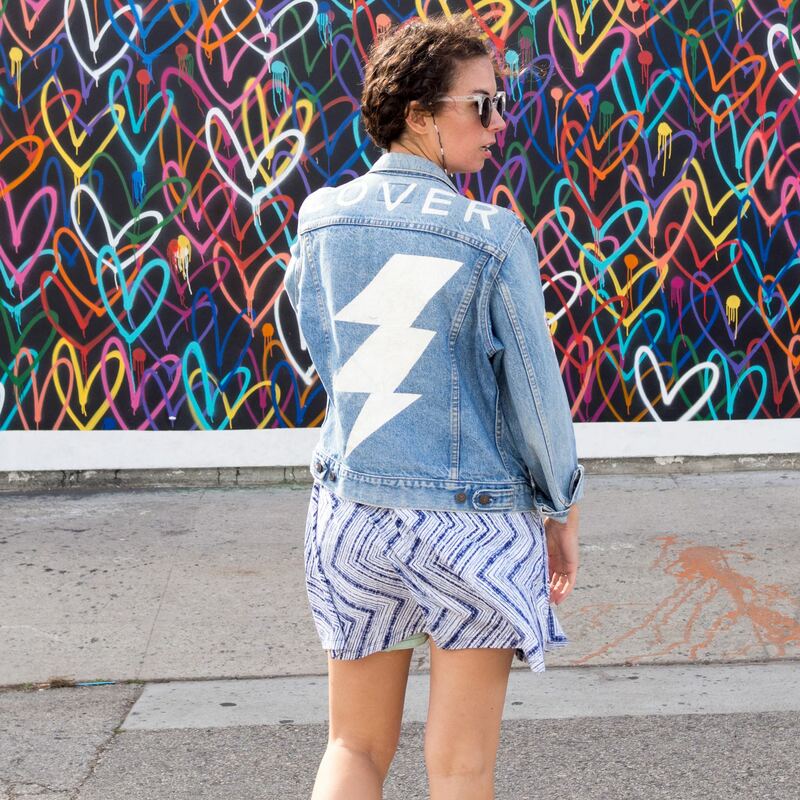 Expect to wait in line for a while, but trust me: it is soooo worth it! 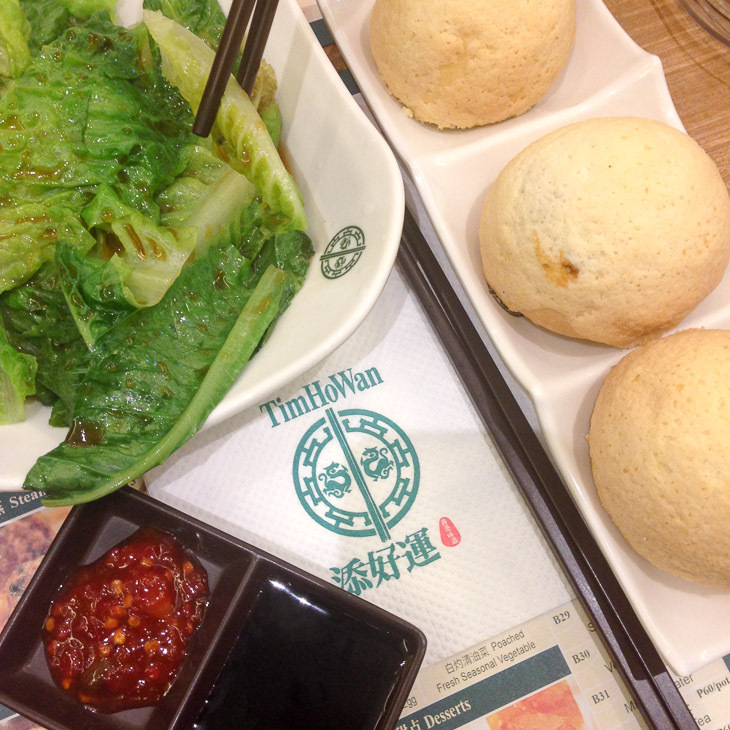 The main draw at Tim Ho Wan are the char siu bao, baked buns with BBQ pork. Crispy on the outside, deliciously sweet and salty on the inside. What more could you possibly want? 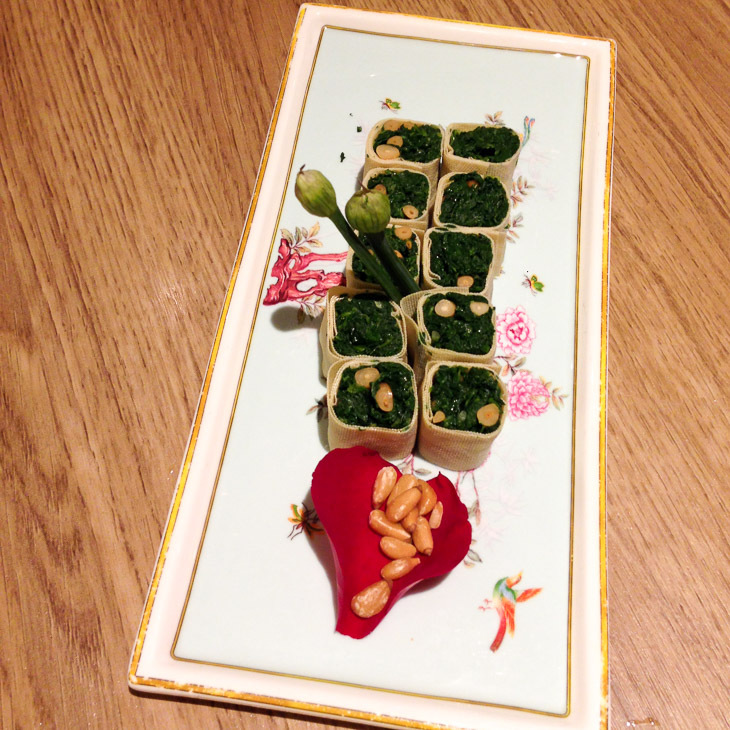 We also had these translucent spinach dumplings that were very good (and pretty! 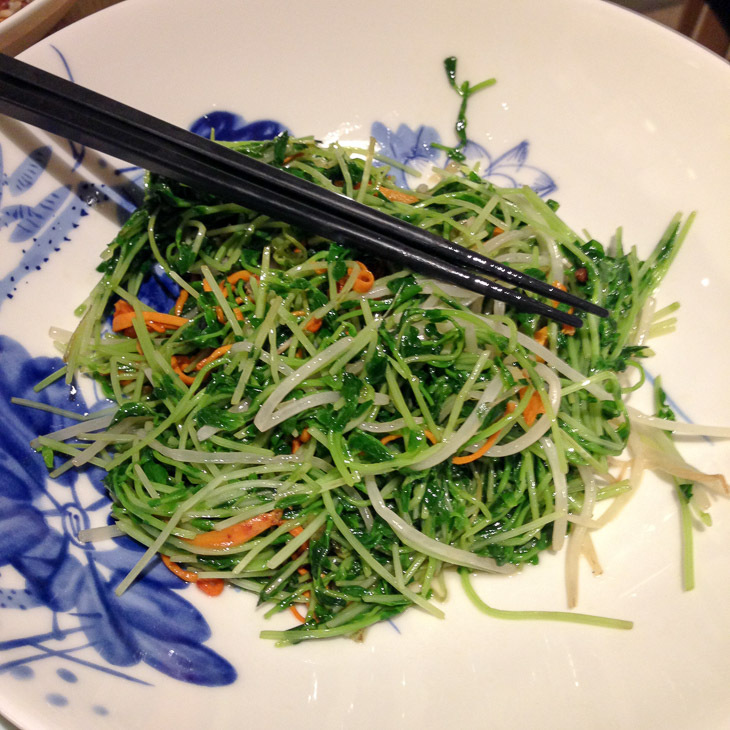 ), something with bean curd and shrimps and sweet and soy tossed cabbage. All this for just over €10. What?! 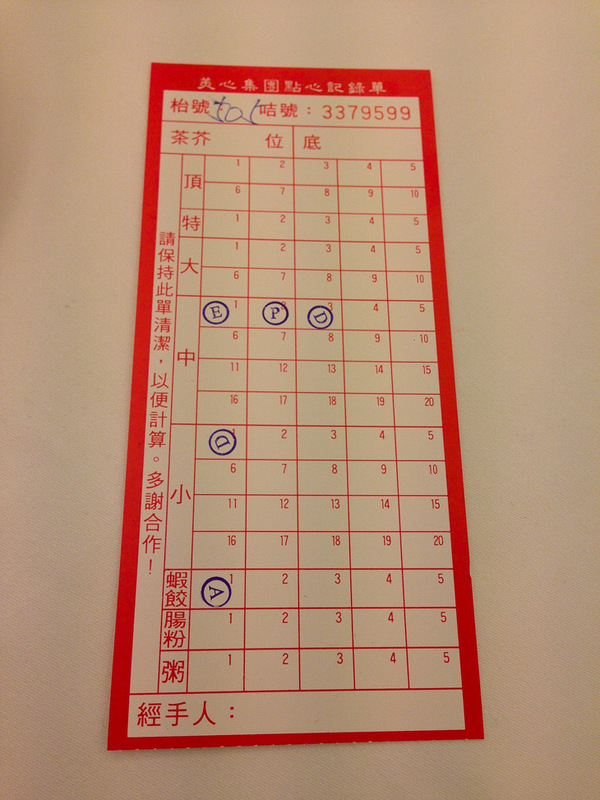 Even though I very much loved Maxim’s and Tim Ho Wan, my favourite dim sum place in Hong Kong has to be Din Tai Fung – also awarded with a Michelin star. 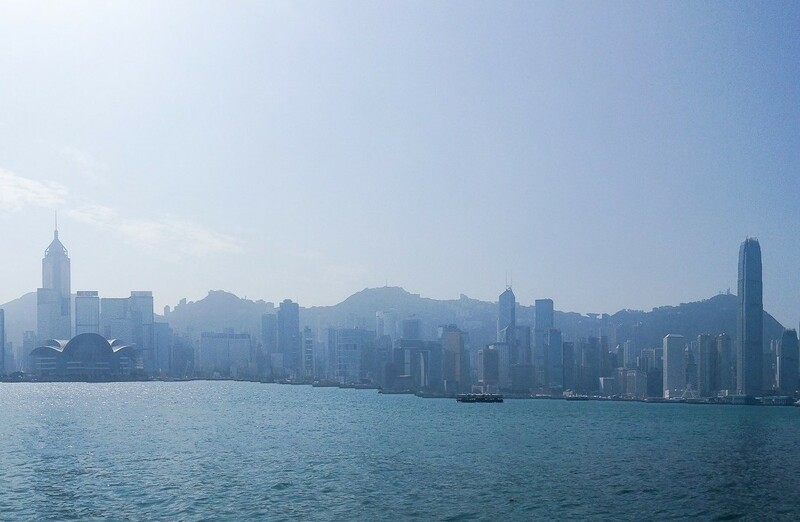 We visited the Silvercord branch back in 2013 with friends who live in HK, and we couldn’t wait to get back here. As always, the trick is to arrive late so you don’t have to wait for a table too long. What I love is that you get to see the dim sum chefs at work, and making all those tiny folds in one single dumpling is really a form of art. Food art that is. 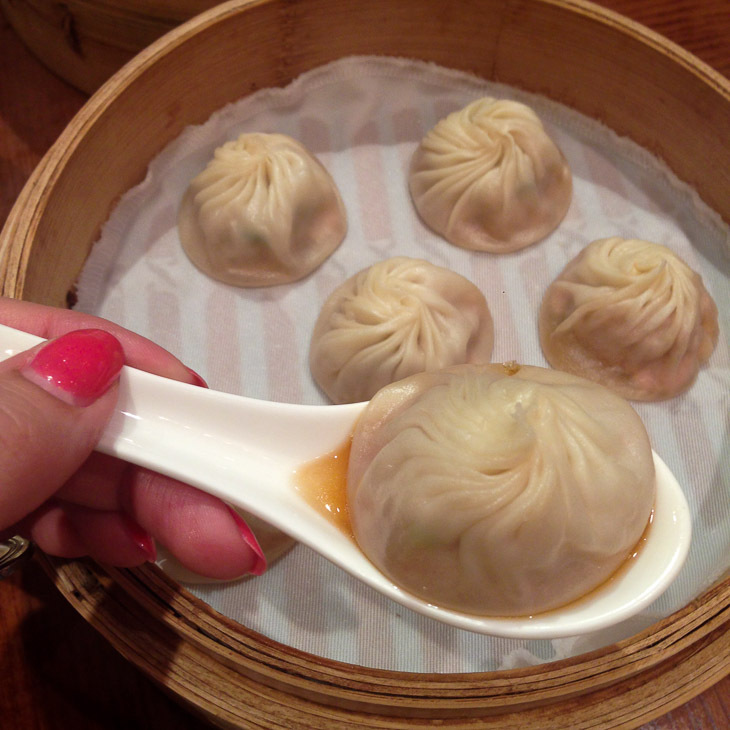 The absolute number one top favourite at Din Tai Fung are the xiao long bao or “soup dumplings”. Oh boy, these things are so freaking delicious! 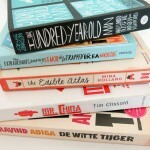 I get excited even writing this post :). 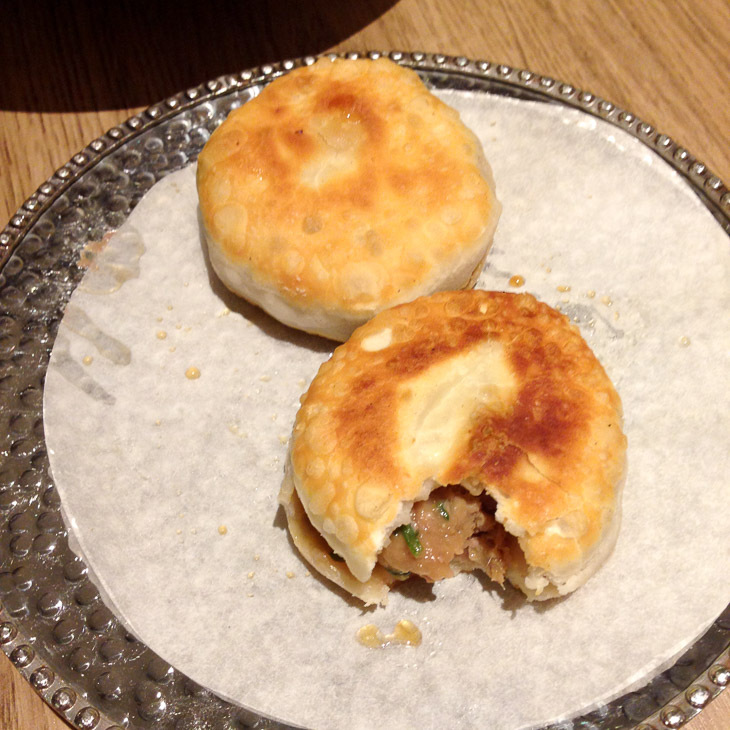 The dumplings are wrapped with the softest, thinnest dough and are filled with juicy pork mince and broth. 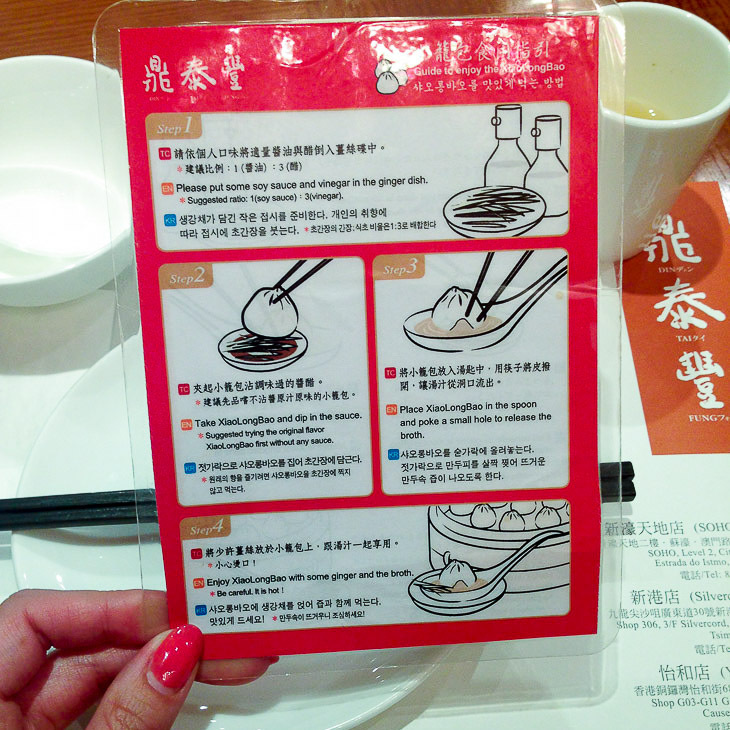 Din Tai Fung actually provides you with an instruction card on how to best eat the xiao long bao. First you dip the dumpling in a soy, vinegar and ginger mixture. Then you place the dumpling in the spoon. Poke a little hole in the xiao long bao with your chopstick, and quickly place the whole damn thing inside your mouth. Wait for it. BOOM! Taste explosion or what?! 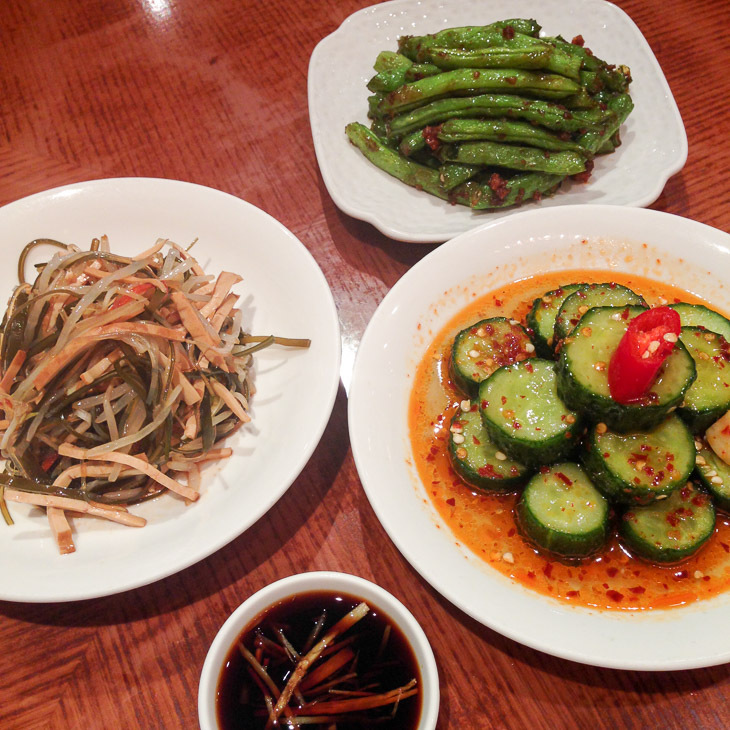 Other great choices are the spicy cucumber with chili and garlic, the green beans with pork mince, the shredded bean curd salad, the spicy wontons and the loofah dumplings. But I honestly think you can’t wrong with any dish on the menu here! If you can’t make it all the way to Hong Kong: Din Tai Fung has franchise locations throughout Asia, and apparently also has branches in Australia and the USA. Only opened in December 2013 and already one of the stars of Maxim’s Group, one of the largest F&B groups with more than 50 brands and 800 branches throughout Asia – including Maxim’s Palace. 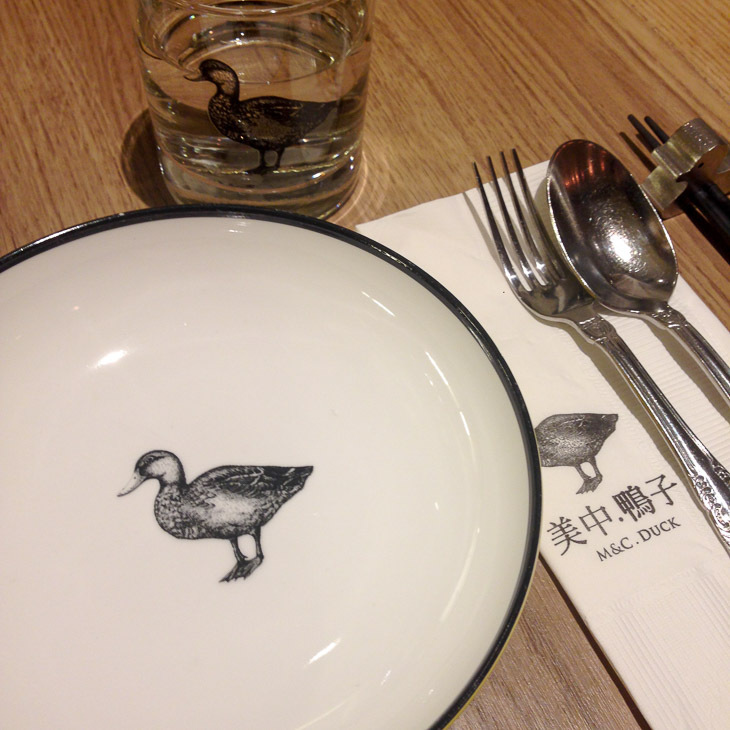 M&C Duck has a fresh and modern interior that is clearly targeting a young & hip crowd. 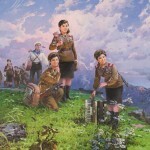 I am very young & hip of course so I obviously loved the minimalist design and look and feel of the place. 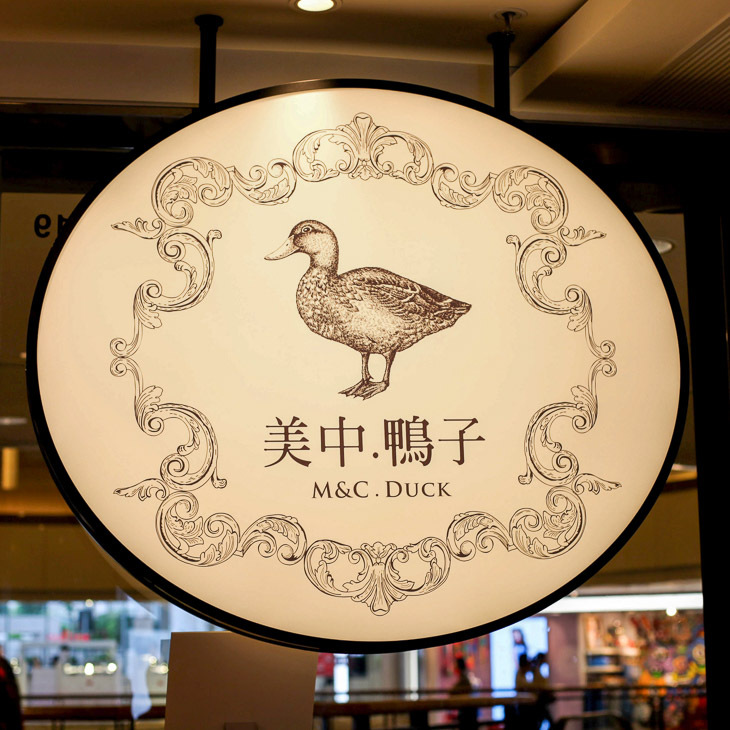 It is located within the massive Harbour City Mall, so I suggest you pick a number and go shopping for half an hour before you return to M&C Duck to check if your table is ready. 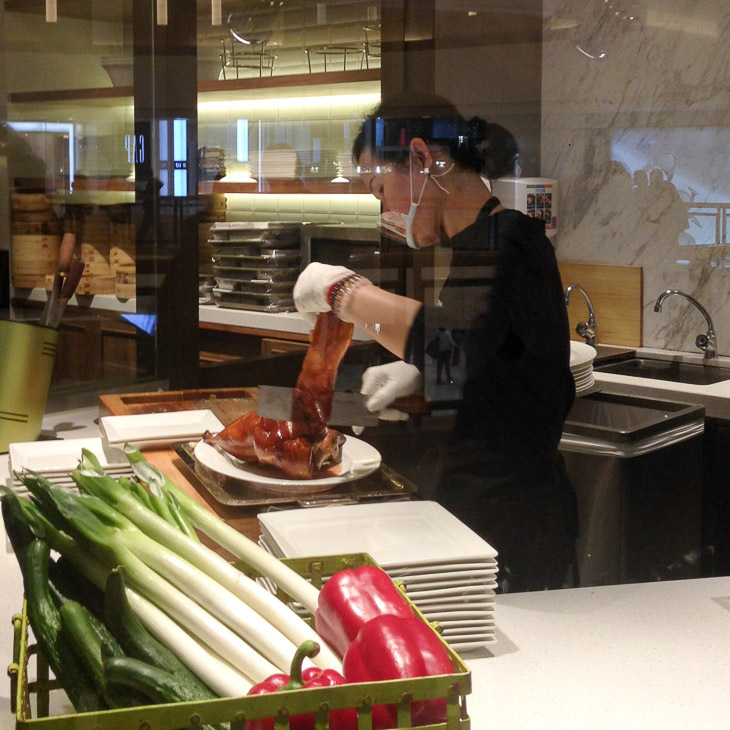 I guess it’s not a big surprise that what you have been waiting in line for is delicious and perfect Peking duck. You can see lovely ladies prepping and trimming the ducks in front of the restaurant, which is quite fascinating. 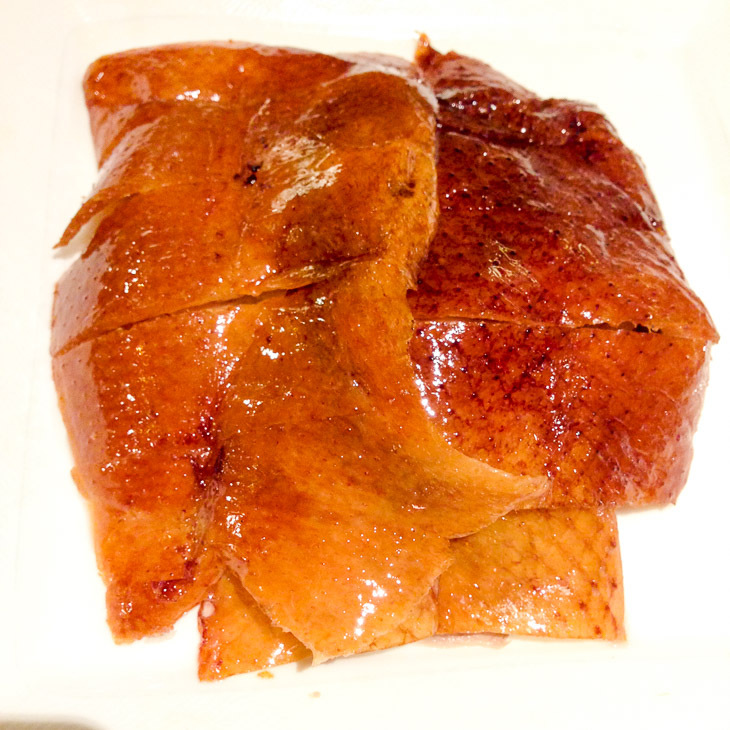 But beware, by staring at those crispy duck skins and that soft juicy duck meat, your wait will feel even longer than it already is. That duck is so freaking good! 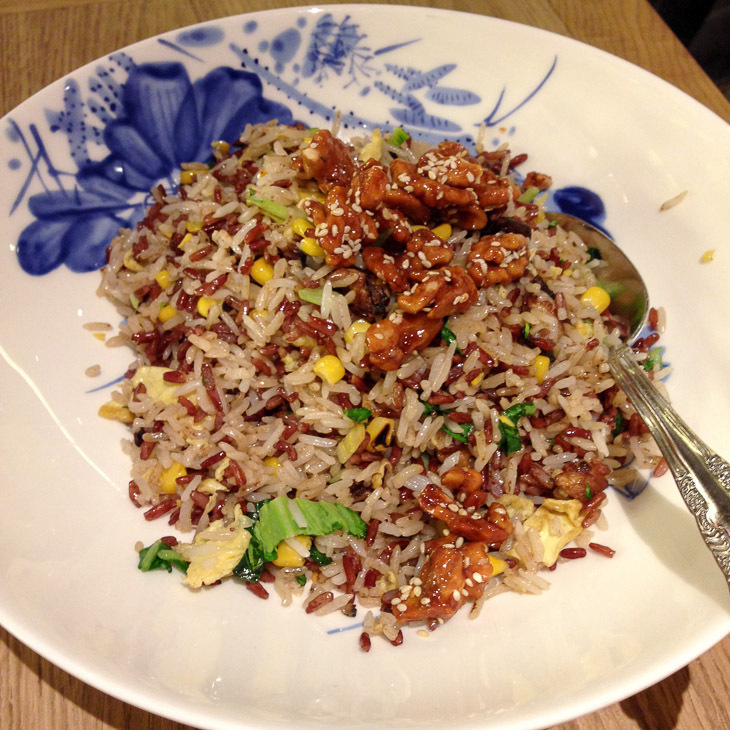 What I love is that M&C Duck serves traditional Chinese (inspired) food, but with a modern twist. I think we overdid it a bit here because the dishes just kept coming and coming :). What can I say? I love Chinese food! 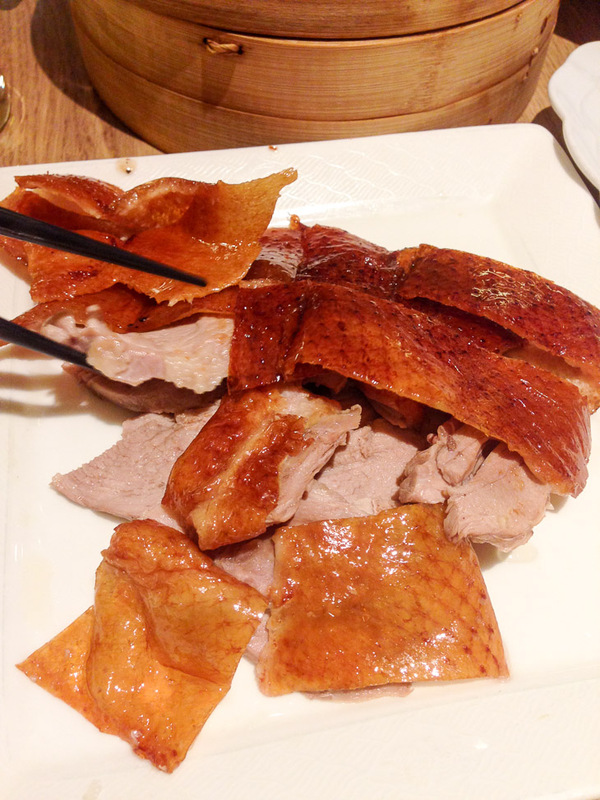 I’d say M&C Duck highly lives up to its reputation and I can’t wait to go back here next time we’re in Hong Kong. 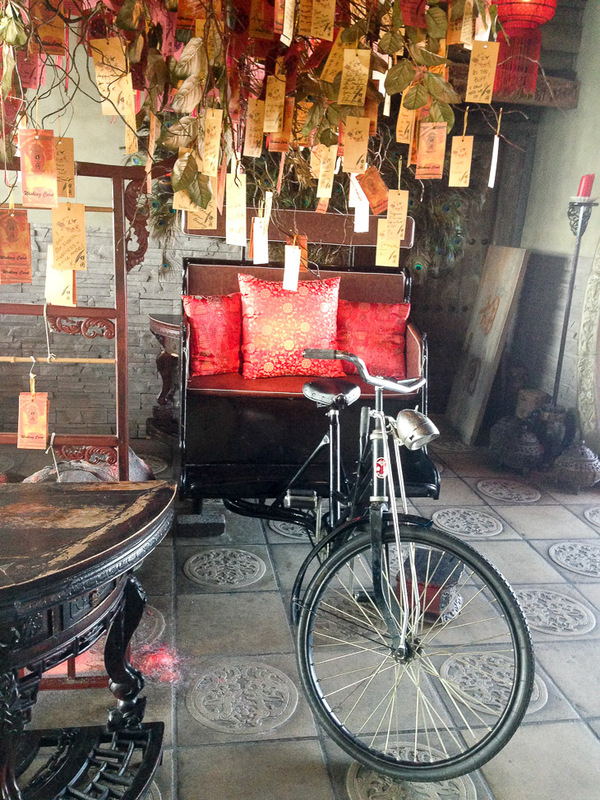 Last but DEFINITELY not least: Hutong. My number one favourite restaurant in Hong Kong. 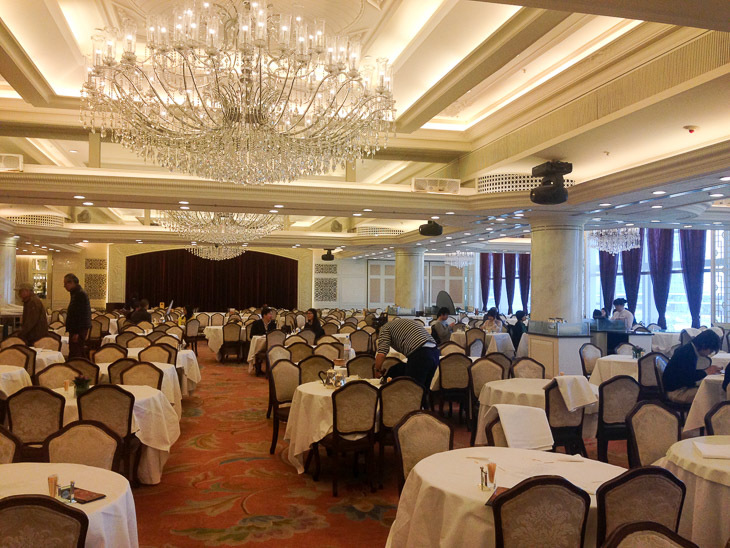 I was so super excited to go to this place, since it is one of the top 5 Chinese restaurants in the world. In the world, people! 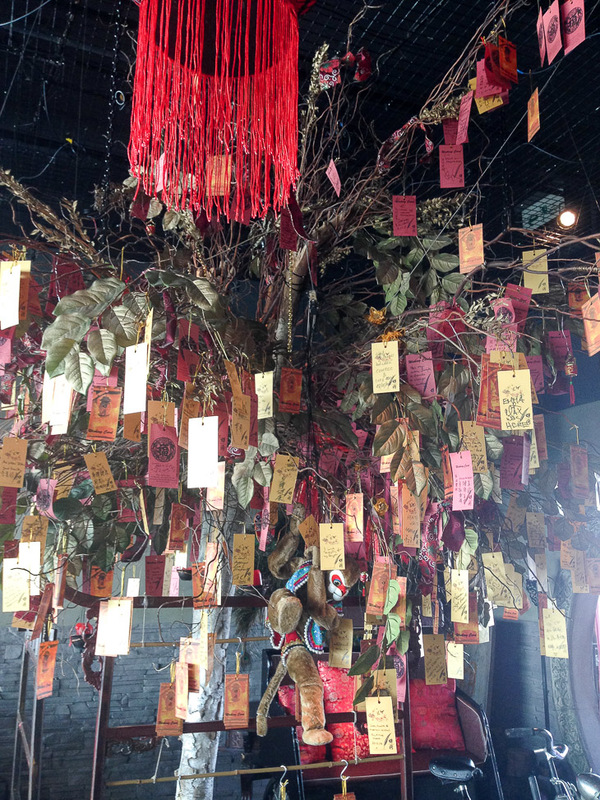 Think about how many Chinese restaurants there are in the world. Anyway, the anticipation almost took over when we entered this gorgeous place. 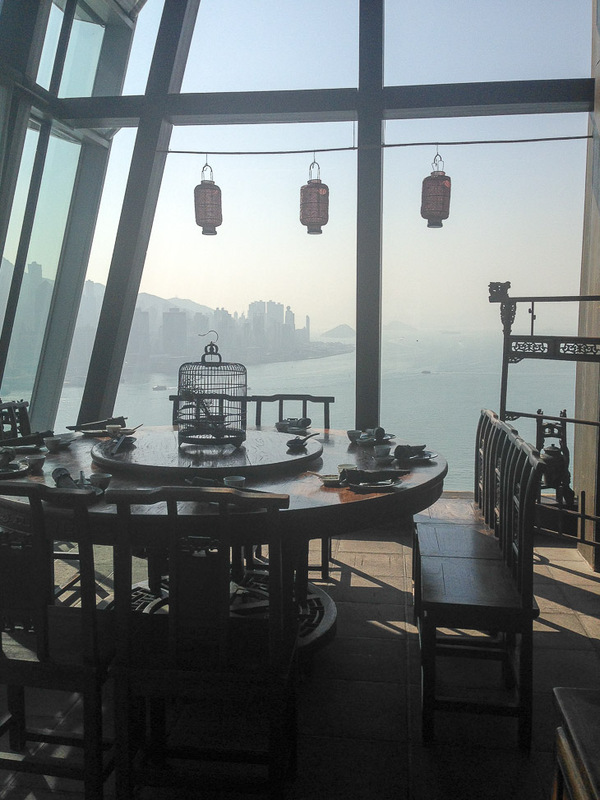 Hutong is located on the 28th floor of the One building on Peking Road and it has the best view ever. 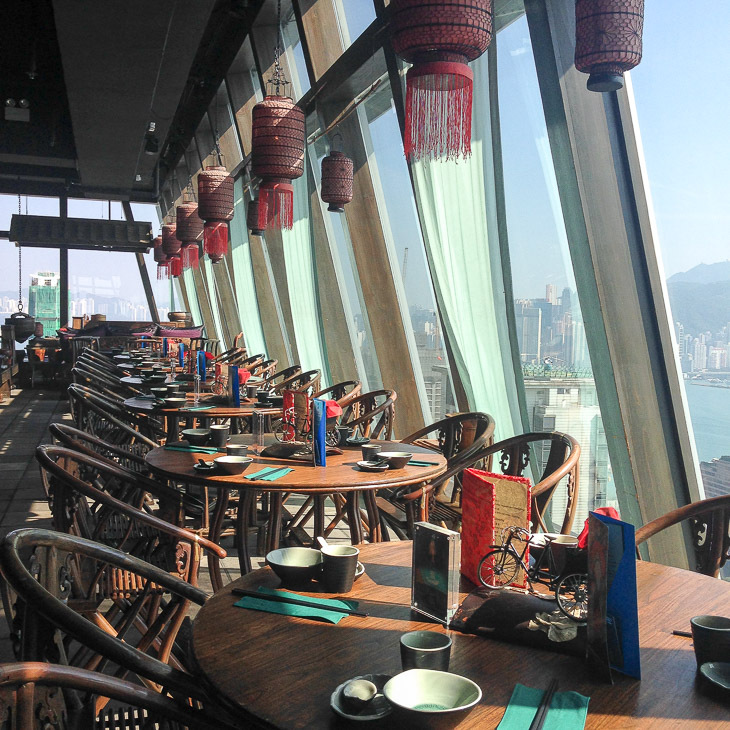 The entire restaurant is based around the large windows and therefore provides amazing views over Victoria Harbour and Hong Kong Island. In mandarin, the word Hutong refers to the small streets and alleyways in Old Beijing (we actually stayed in a Hutong in Beijing in 2013). 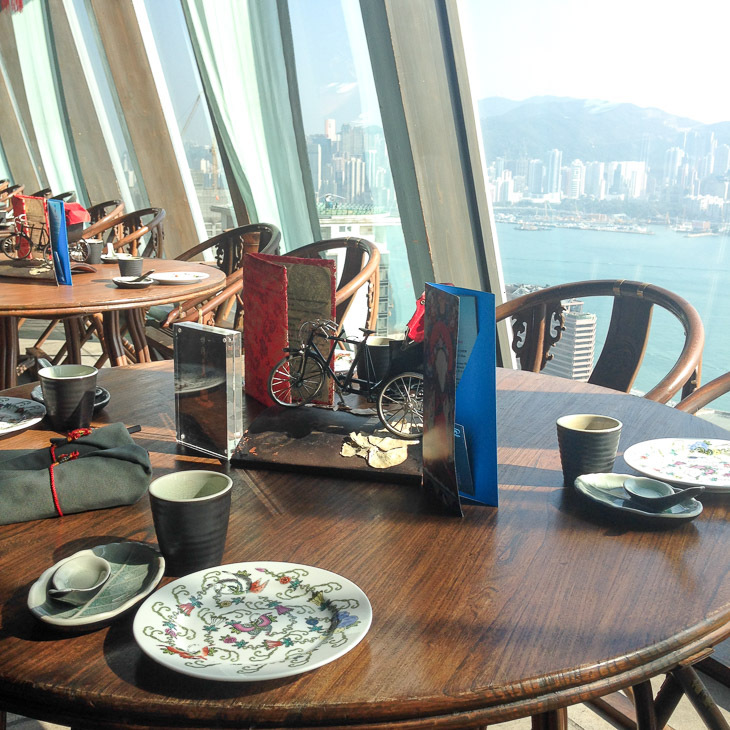 And the interior and design of the restaurant really makes you feel like you’ve stepped back in ancient China, but with the fascinating modern skyline of Hong Kong outside the windows. So amazing. As entrees we had the scallops tossed with pomelo and the lamb & scallion dumplings, both delicious, but especially the scallops were very interesting. In a good way that is. Next we ordered a few dishes to share. I highly – HIGHLY – recommend the “Ma La” Sichuan pepper prawns, but be ready for some serious spicyness. We also had the grilled succulent pork belly skewers, the Chinese kale with ginger and the traditional Hutong fried rice with shrimps and fennel. 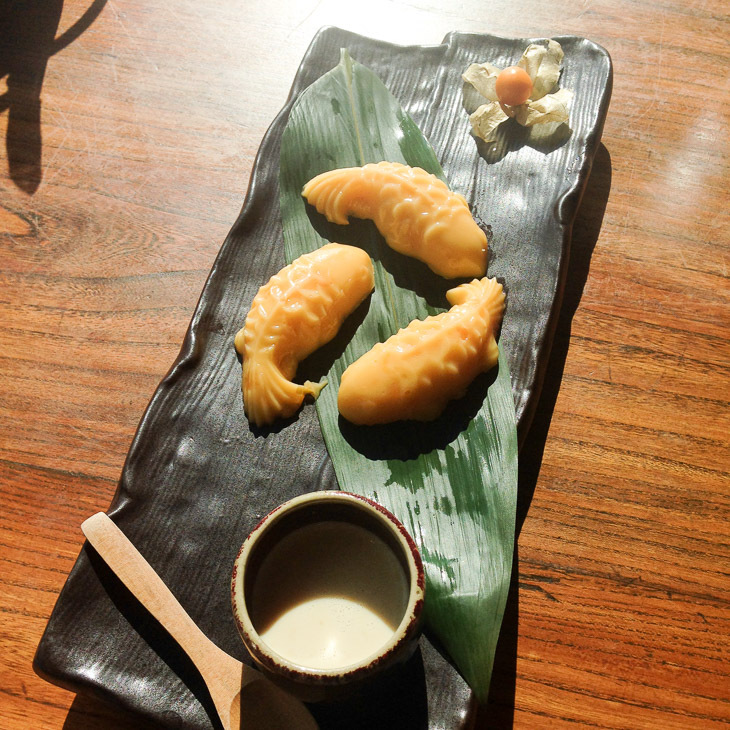 For desert we shared the beautiful fish shaped mango pudding with coconut cream. Wow. Wow. Wow. Wow. One More Month And Then: INDIA!